Until now, I wasn’t fussy. I wouldn’t have specified brand names or quantities. Simply 'lots. With everything.' That would be my last request. I’ve changed my mind. My final meal on earth would be these hot dogs. Homemade buns. Homemade relish. Ketchup. Mustard. Fried onions. And beef sausages. 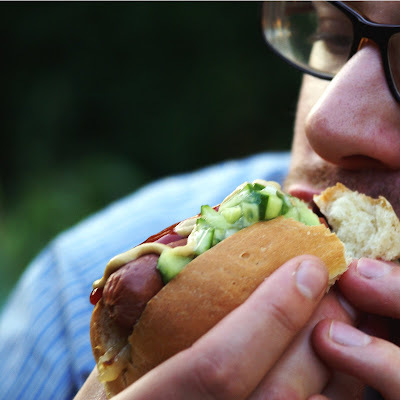 Throughout Europe hot dogs are almost invariably made of pork. But with a historically large Jewish, and increasingly Muslim, population in New York, sausages here tend to be all-beef. It’s hard to find a kosher or Halal pig. Your nearest Middle Eastern supermarket will be the best place to pick up beef hot dogs. NB Recipe inspired by and modified from one in Gourmet magazine. Mix all these together. That’s it. To make the buns, bring the milk and cream to a gentle simmer and leave to cool. Add the yeast to the warm water and leave for five minutes until it starts to foam like a rabid dog. Mix the sugar and salt into the flour, pour in the foaming yeast mixture and then the cooled milk and cream (if it’s too hot you will kill the yeast, in the manner of a cruel Eastern European dictator wiping out a persecuted ethnic minority). If you have a mixer, use the paddle to mix the wet doughy mass for about six minutes. 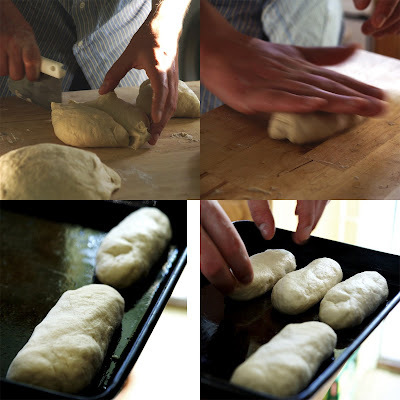 If the dough is too wet, incorporate more flour until the dough just comes together. If, like me, your mixer has exploded in a cloud of acrid black smoke and you are too scared to turn it on, you will be doing this by hand. Once the dough has been stirred together, turn out onto a floured surface and knead vigorously for about ten minutes. Add more flour whenever necessary – this is a wet dough. Turn it back out onto a floured surface and knock it back down by kneading it for another couple of minutes. 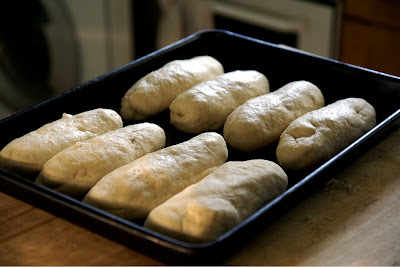 Divide the dough into 16-20 equal sized pieces, roll them into a vague sausage shape (about six inches) and then place them evenly spaced on a baking sheet. Leave a couple of centimetres between each one and let them prove, again covered with a damp tea-towel. About 45 minutes should do it. 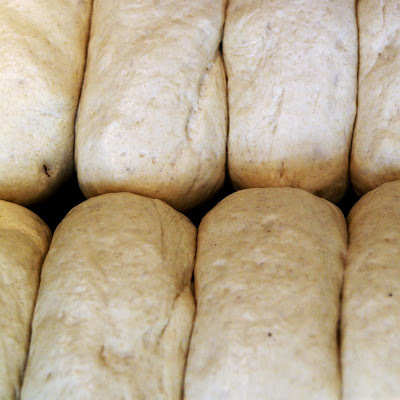 Once your buns are touching and have near doubled in size, bake them in a pre-heated oven (about 175 degrees C) for 15-20 minutes, moving them from the top of the oven to the bottom about half way through. This will brown the tops whilst making sure they are cooked all the way through. Remove them from the oven and leave to cool for ten minutes before putting them on a cooling rack. Slice the bun down the middle, fill with fried onions (you don’t need a recipe for those, do you? ), pop in a sausage that has been simmering away in murky water for six hours (if you want the really authentic NYC experience) and top with relish, ketchup and mustard. This is without a shadow of a doubt the best hot dog I’ve ever had. The buns are light, soft and delicious but don’t have that cloudy, fluffy texture of bought buns. The relish is sharp, cool and sweet, the perfect counterpoint to the rest of the flavours and textures. And the sausage? It’s a hot dog. You know not to expect artisanal spiced cuts of premium Saddleback pork. But that doesn’t make it any less tasty. Here’s to the guiltiest and most pleasurable of guilty pleasures. Perfect for July 4th. 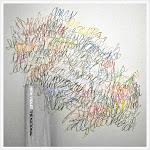 Signe - Thanks. And yes, give it a go. Was so impressed with it. How perfect! Well done. I like mine with melted cheese too, but in the UK I haven't been able to get the right sort of cheese. I've just recently moved to New York City and for the first time, living on my own. Your blog is great for me to use as reference when I try to cook!!! 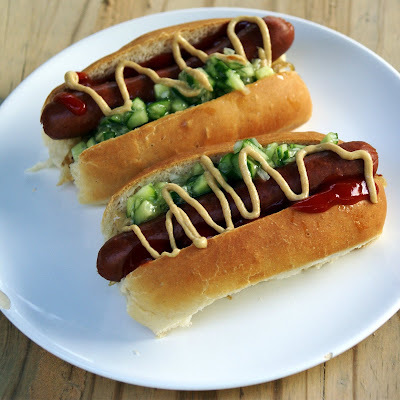 Looks really tempting, and this is a compliment as I am never tempted by a hot dog .. if only I knew where the hot dog comes from ..
Oh I like the bun recipe.. my hubby and I always like to have hotdogs some nights when we are home for supper. I can find the hotdogs alright,,but we are always out of buns..and no one wants to go out to get them.. So we cancel and order chinese. Now this will help me alot!! SOunds easy enough! Ohhhhh, your buns look good (lol). I made homemade hot dog and hamburger buns for the Fourth as well, and there were fantastic. I will still have to try your recipe. It seems like it will be pretty rich with cream and milk in it. The bun recipe I used was like a light brioche. Thanks for posting this! 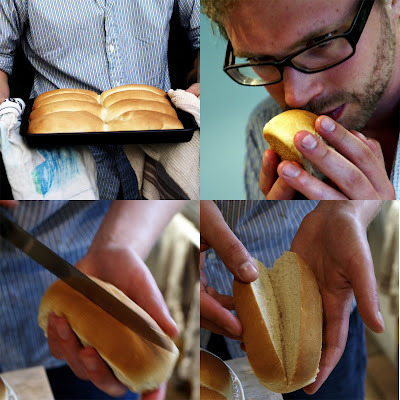 I love the photo of you smelling the bread. I can only imagine how good it smelled. Foodycat - Sounds fab. Do you need that heavily processed stuff that is so wrong but so right at the same time? Duaba - Thanks so much, let me know how things turn out. Thanks Junglefrog. It's hard (and unecessary!) 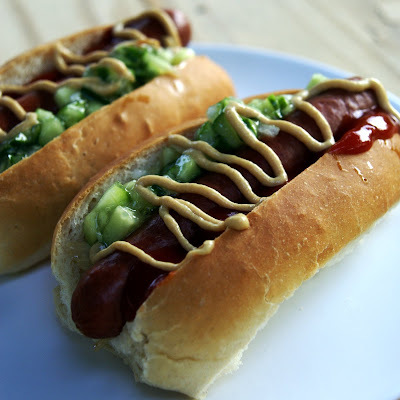 to elevate the hot dog to grand heights but the homemade buns are good. Cynthia - My GF said the same thing. She won't be able to enjoy another hot dog now. World in a Pan - yes, it's one of those dishes where it's hard to stick to one's principles. RDS - Thanks very much. Glad to be of service! What temperature should the milk / cream be when you add the yeast? I've tried it a couple of times (the first time I'm sure the mix was too hot) but the yeast has failed to do anything.